Rosco and I played our game this evening. I think Ross handled King & Robber Baron better than I handled Traders & Builders but the long and the short of it seemed to be that I got most of the tiles Ross needed as well as a few that came in pretty handy for myself. I focused quite intently on creating opportunities to trap Rosco whenever I could, and in most cases this seemed to be quite effective, especially when it came to blocking his farmers. The wide range of uncommon tiles in T & B meant there was always a chance he could escape, and in several cases he did. 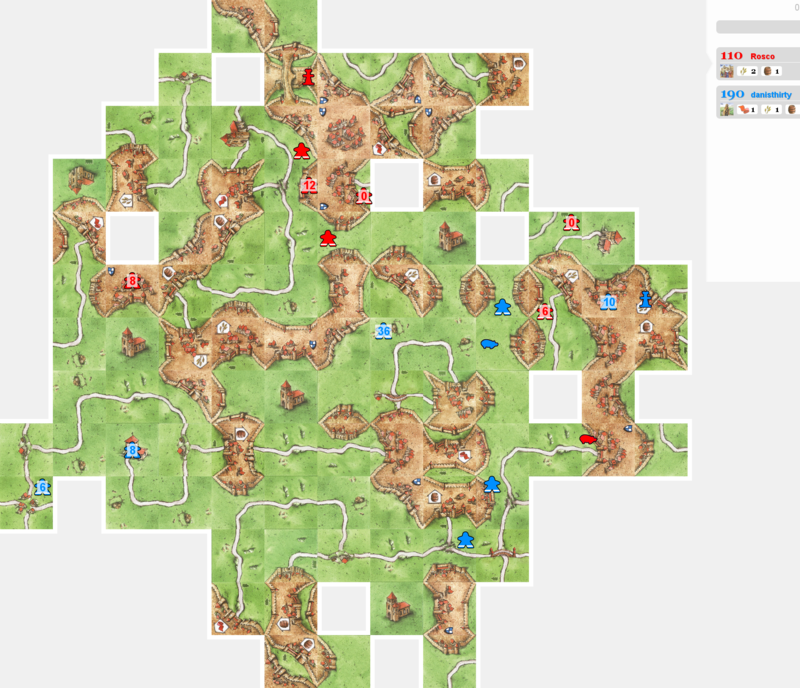 But as I said, lady luck was smiling on me this time (unlike during my game with Chooselife earlier today which was a disaster right up until the game crashed as I was placing the final tile) and I could usually find a helpful place to put most of the tiles I drew. In terms of the newly revised scoring system I took 1pt for the win and 3 more for winning most points for roads, cloisters and farms. Interestingly we drew on cities which means we talk 0.5pts each for this, putting the final scores at 4.5 / 0.5 to me. The 'testing league' is starting to look embarrassingly in favour of Dan at the moment. Can we do something to address this dire situation? Anyone able to play today/tonight? I will see if I can make a game tonight. Will be in touch. That was the most frustrating game i have ever had. 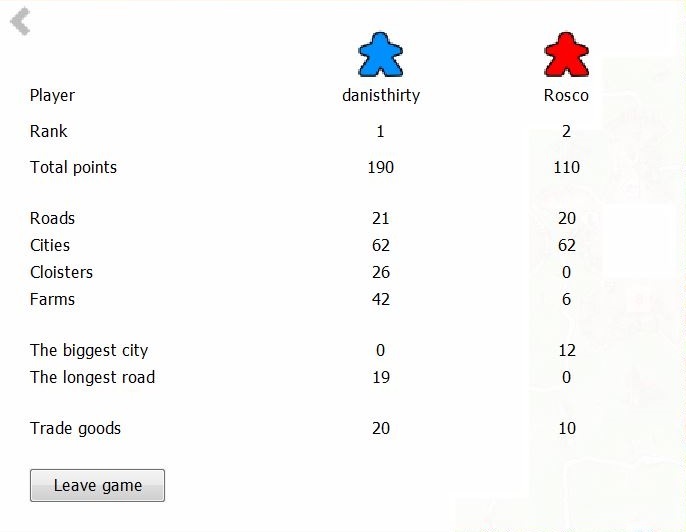 From word go we were very evenly matched and it was constantly relatively even scores wise. Steve trapped a few of my meeples and steve seemed to get every tile i needed. however i kept holding on right to the end. Steve had built up a huge city with his builder and i had 2 meeples ready to glom on but i just could seem to get the right tiles for either of them, until i got one of them and i was sharing. Then 3 tiles from the end steve got the other one and i believe his tactic was to let me complete the city and get a 2nd meeple in from his meeple on the city. It didnt work quite right as it wasnt enough for steve to clinch it. I then won the game albeit by just a few points. final game league score was 3 - 2 to me. Well played Rosco. This was always going to be a tight game, and you deserved the win. Interestingly, I am still above you in the league having lost both games, and you having won one of your two. This is what was intended, as we are trying to encourage ‘close’ enjoyable matches. At least I appear to have got something right. Thanks again for an excellent evening, despite losing our first attempt on the public server. This needs to be fixed and I will be seeking advice from Farin tomorrow. Attached is the latest version of the league table. It is showing some interesting results even at this early stage. I am looking forward to seeing a few more games added in the very near future. Testers - please let other players know when you are available. I should be available to play again tonight. Steve any chance you can change the images from png to jpg. As I can't zoom in to read it. Added jpg to the above. Have you tried moving your SM-A320FL closer to your face? A great game between Chooselife and I, which concluded today after a 2 or 3 day gap when the first half of the game bombed out. Fortunately I'd saved it. Chooselife was quick to use his tower blocks to capture my meeples, which were sometimes placed purely to encourage him to do this! I did have to buy a few (3) of them back when I needed them which swung things 18pts in Pedro's favour but it was worth it for the feeling of security this gave me towards the end of the game when he'd run out of tower blocks! 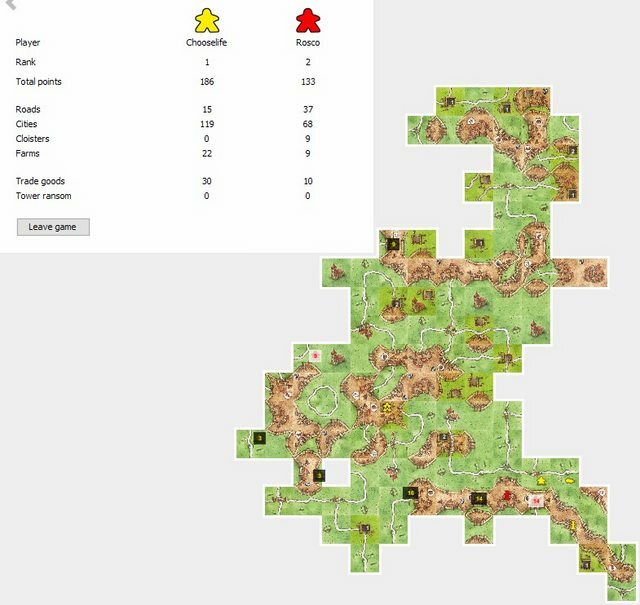 In terms of score I was about 30 - 35 points behind when we started the second half of the game but I did have the main farm and was close to closing a tidy city for a decent handful of points. The fact that Pedro couldn't remove me from the farm with towers worked out well, but he couldn't easily attack it either without me removing him. So I was able to keep the farm despite Pedro having almost all of his meeples in hand to attack it with! King & Robber Baron also worked in my favour. I won the King tile much earlier in the game but lost out on the Robber Baron tile until much later. 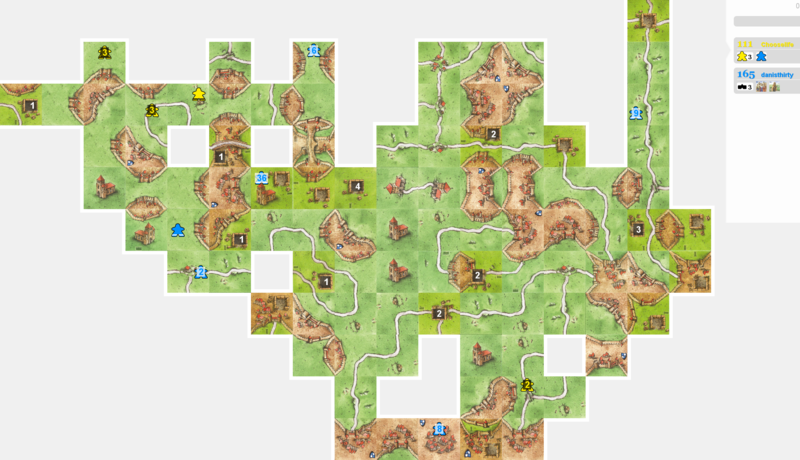 An earlier attempt to close a long road was thwarted by the fact that I simply couldn't draw the tile I needed to do so. Several of them were left in the deck, but Pedro kept drawing them and then refused to close my road! I guessed this was because he didn't want to give me the points and a meeple back, even though it might have been worth it for the RB bonus. In the end I gave up on that road and wasted a tower block to get my meeple back from it, then completed another road elsewhere to win the RB bonus. 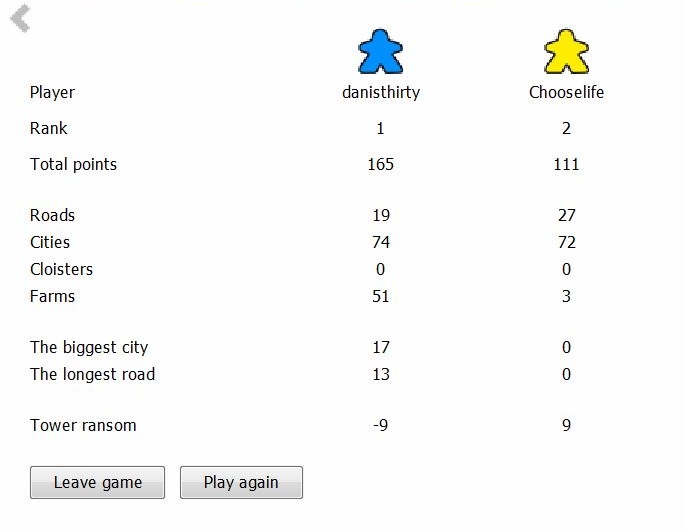 In terms of score I get 1pt for the win + 2 more for winning on cities (just) and farm points. Pedro gets 1pt for winning most on roads (by a long way). And we both get 0.5pts because neither of us scored anything from cloisters (this is despite almost all of the first 4 or 5 tiles being cloisters, but all the monks got kidnapped so no points were scored from them). If the game had all been played in one go it might have been more obvious that there was an easy point to be won by simply claiming a cloister, but because of the crash and then the restart I don't think this was in either of our heads. It certainly wasn't in mine anyway. Overall though, great game! Thanks dude! Lucky draw made the difference both for the bigger cities and a couple of towers. A 3-2 win to chooselife. I am really starting to appreciate this type of scoring. I hope that the game was actually as close as the score shows.